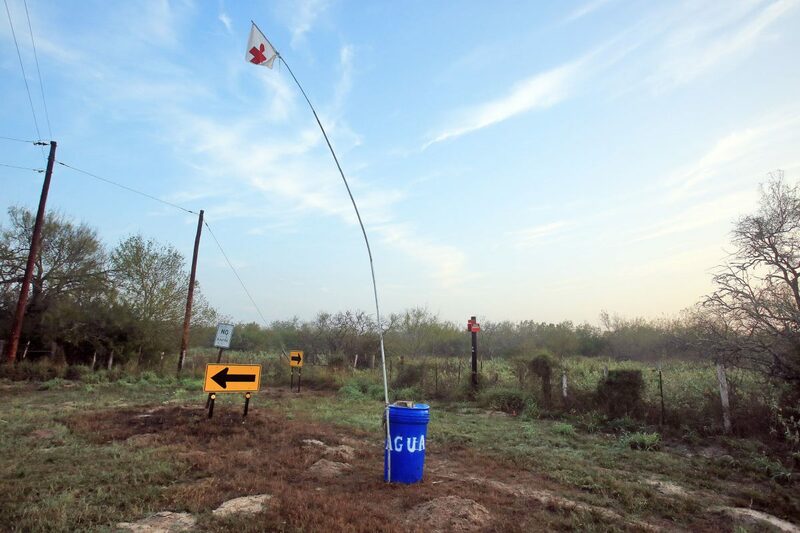 A water station sits on ranch land near U.S. Highway 281 south of the U.S. Border Patrol checkpoint Nov. 29, 2016, near Falfurrias. More migrants were found dead along the U.S.-Mexico border in 2017 than the year before, according to data released this week from the International Office for Migration. The United Nations agency said 412 migrants were found dead in 2017, 14 more than 2016. The number of migrants who died crossing the border remained high, despite the 44 percent decrease in apprehensions reported by Border Patrol in 2017 during the first year of Donald Trump’s presidency. “The increase in deaths is especially concerning, as the available data indicate that far fewer migrants entered the U.S. via its border with Mexico in the last year, said Frank Lackzo, the director of IOM’s Global Migration Data Analysis Centre. As enforcement of the nation’s southern border increases, and with it the likelihood of arrest, migrants seek out more remote and dangerous routes, IOM noted. High temperatures in the border region is often a leading cause of migrants’ death. Texas saw the largest spike in deaths of the border states, with an increase of 40 deaths for a total of 191 deaths in 2017. IOM’s Mexico office attributed this increase in part to heavy rainfall in early 2017 that made the Rio Grande flow faster and deeper, and hence harder to cross, resulting in multiple drownings. Five migrants drowned in July as they attempted to cross the river between Juarez, Mexico, and El Paso. Also included in the data for Texas were the 10 migrants who died in a sweltering tractor-trailer parked at a San Antonio Walmart in July. More than two-thirds of migrant deaths in Texas occurred in the Rio Grande Valley, which had the largest number of migrant apprehensions of all the U.S. Customs and Border Protections southwest border sectors. The sector had 137,562 apprehensions for the 2017 fiscal year, which ended Sept. 30, 2017. Most of the deaths were reported in Brooks County, where migrants attempt to bypass Border Patrols’ inland Falfurrias checkpoint by hiking through dry ranch land. Thirty-eight deaths were reported in the county, many of which were discovered as skeletal remains. Fourteen deaths were reported in Hidalgo County, three in Starr County and one in Cameron County. The data, however, is likely incomplete, notes IOM. Its Missing Migrants Projects relies on data collected from sheriff’s offices, Border Patrol, nonprofits and local media outlets. “Because many bodies are difficult to identify due to severe decomposition and a lack of identifying documents, local authorities may not always identify migrant deaths as such,” stated an agency press release. So far in 2018, IOM has collected data on 14 deaths along the U.S.-Mexico border. One of these included the body of a man discovered in the river near Hidalgo on Feb. 3. The Hidalgo County Sheriff’s Office confirmed the Mexican man’s identity Thursday, noting that his family told investigators he had been missing since mid-January. Five deaths have been reported so far in Brooks County, two of which listed cause of death as exposure to the elements.